For the emirate, see Daura Emirate. For people, see Daura (surname). 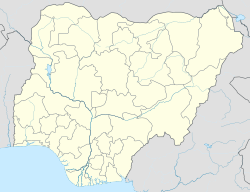 Daura is a town and Local Government Area in Katsina State, northern Nigeria. It is the spiritual home of the Hausa people. The emirate is referred to as one of the "seven true Hausa states" (Hausa Bakwai) because it was, (along with Biram, Kano, Katsina, Zazzau, Gobir, and Rano), ruled by the descendants of Bayajidda's sons with Daurama and Magira (his first wife). The University of California's African American Studies Department refers to Daura, as well as Katsina, as having been "ancient seats of Islamic culture and learning." Daura is the city that Bayajidda, a figure from Hausa mythology, arrived at after his trek across the Sahara. Once there, he killed a snake (named Sarki) who prevented the people from drawing water from the well, and the local queen, Magajiya Daurama, married him out of gratitude; one of their seven children was named Daura. The Kusugu Well in Daura where Bayajidda is said to have slain Sarki is protected by a wooden shelter and has become a tourist attraction. In 1805, during the Fulani War, Daura was taken over by Fulani warrior Malam Ishaku, who set up an emirate. The Hausa set up rival states nearby, and the ruler of one, Malam Musa, was made the new emir of Daura by the British in 1904, While Fulani emirs reigned and established a rival kingdoms at Daure-Zango (Zango) and at Daure-Baure (Baure). Zango (founded in 1825) was the more prominent Hausa-Daura kingdom, and in 1903–04, after the British and French had divided the three Daura polities, the British installed Zango’s king, Malam Musa, as the new emir of Daura. Part of former North-Central state after 1967, the traditional emirate was incorporated into Kaduna state in 1976. It became part of the newly created Katsina state in 1987. Faruk Umar Faruk became the 60th Emir of Daura on 28 Feb 2007 following the death of Sarkin Muhammadu Bashar dan Umaru. The Daura Royal Palace ‘Kangiwa’ is a huge complex located in the centre of the ancient city. It is a symbol of culture, history and traditions of ‘Daurawa’. The Daura Emirate is referred to as one of the "seven true Hausa states" (Hausa Bakwai) In 1805, during the Fulani War, Daura was taken over by Fulani warrior Malam Ishaku, who set up an emirate. The Hausa set up rival states nearby, and the ruler of one, Malam Musa, was made the new emir of Daura by the British in 1904. , the Emir of Daura still rules as a ceremonial hereditary monarch, and maintains a palace. Umar Faruk Umar became the 60th Emir of Daura on 28 February 2007 following the death of Sarki Muhammadu Bashar Dan Umaru. Daura is a centre of both formal and informal education. The education system is the 6-3-3-4 system, which is practised throughout the country (as well as by many other members of the Economic Community of West African States). The levels are Primary, Junior Secondary School (JSS), Senior Secondary School (SSS), and university. All children are offered basic education, with special focus now on the first nine years. Daura is home to various primary, secondary, postsecondary schools, and other vocational institutions that are either operated by the government or private entities. The emir of Daura hosts a Durbar to mark and celebrate the two annual Muslim festivals Eid al-Fitr (to mark the end of the Holy Month of Ramadan) and Eid al-Adha (to mark the Hajj Holy Pilgrimage). In Addition to them he also hosts a Durbar of Gani which is celebrated often on the 12th day of Rabi' al-awwal, the third month in the Islamic calendar. The Durbar culminates in a procession of highly elaborately dressed horsemen who pass through the city to the emir's palace. Once assembled near the palace, groups of horsemen, each group representing a nearby village, take it in turns to charge toward the emir, pulling up just feet in front of the seated dignitaries to offer their respect and allegiance. Daura has many hospitals and medical facilities, The Daura healthcare system is generally divided into public and private sectors which provide medical services at the primary and secondary levels. Although the private hospitals are usually more expensive, it does not necessarily translate to better healthcare delivery. Daura's population was estimated as 25,151 as of 1972. According to the MARA/ARMA organization, malaria affects Daura for four to six months of the year, and is "endemic and seasonal." In 2005, after an outbreak of measles in Katsina State, Daura became one of five training centers for workers who were to carry out immunization. On vehicle license plates, Daura is abbreviated as DRA. "Alhaji Usman Daura", Chief security officer presidential villa during Alhaji shehu Shagari, general Muhammad buhari, general babangida regime 1981-1989. First commissioner of police federal capital territory 1990, retired as Assistant inspector general of police 1999. ^ a b c d e f "Daura". Encyclopædia Britannica. Encyclopædia Britannica, Inc. Retrieved 21 December 2006. ^ a b c Dierk Lange. "Oral version of the Bayajidda legend" (PDF). Ancient Kingdoms of West Africa. Retrieved 21 December 2006. ^ "African Films and Documentaries: Daura and Katsina, Nigeria. The Hausa Woman". University of California's African American Studies Department. Retrieved 24 January 2007. ^ Bature, Abdullahi; Russel G. Schuh. "Gani Ya Kori Ji" (PDF). Hausar Baka. World of Languages. Retrieved 20 January 2007. ^ "Katsina State". NGEX, LLC. Retrieved 20 January 2007. ^ "Katsina State". Nigeria Direct. Federal Ministry of Information and National Orientation. Archived from the original on 13 December 2006. Retrieved 20 January 2007. ^ a b "Traditional States of Nigeria". World Statesmen. Retrieved 15 September 2010. ^ "INEC registers 1.8m voters in Katsina". The Tide Online. Rivers State Newspaper Corporation. 9 January 2007. Retrieved 24 January 2007. ^ "Nigeria: Duration of the Malaria Transmission Season" (PDF). mara.org.za. MARA/ARMA (Mapping Malaria Risk in Africa / Atlas du Risque de la Malaria en Afrique). July 2001. Retrieved 24 January 2007. ^ "Measles kills 500 children in Katsina". The Tide Online. Rivers State Newspaper Corporation. 25 October 2005. Retrieved 24 January 2007. ^ "NGR - Nigeria - Where's That Vehicle Come From?". Where's That Vehicle Come From?. Retrieved 24 January 2007. Nigeria: Daura's Tales of a Snake, Many Queens. Danjuma Michael, This Day (Lagos). 19 March 2009. This page was last edited on 13 August 2018, at 00:29 (UTC).